Leading mobile service provider Idea Cellular all set to launch “idea Money” a mobile wallet service, across India, similar to Airtel Money and Vodafone M-Pesa. According to our exclusive source, With ‘idea Money’ Idea Cellulars postpaid and prepaid customers can not only be able to deposit and withdraw cash from designated outlets, but they can also transfer money to any mobile phone in India. This money can be used to recharge mobile phone and utility bill payments, to transfer money to any bank account in India and to make payments at select shops. The Mobile-Money services is already quite popular in Africa where the service has been available since many years. In India, Bharti Airtel and Vodafone India already has a similar service under Airtel money and Vodafone M-Pesa brand. In 2011, Idea Cellular got prepaid mobile wallet license and partners with Axis Bank to introduce “idea My Cash” mobile money transfer services. ‘idea My Cash’ services was launched with very limited options, so not become popular among idea customers. 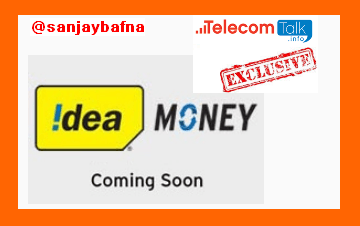 Now idea cellular geared up to launch full-fledged mobile payment service dubbed as ‘idea Money’ like Airtel Money, which will be launched in next few days. I mean you will not be charged for uploading cash for first time.